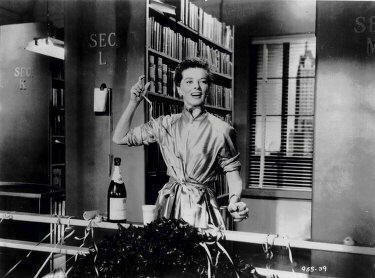 Question: Why does this image from “Desk Set,” starring Katherine Hepburn as librarian Bunny Watson, remind me of Elizabeth Bird? Anyone? Anyone? Bueller? This film’s subject is librarians: who they are, what they do, why they do it, and the impact of their work in people’s lives. The underlying meaning is how we express our own humanity, how we listen to ourselves and one another in the realm of the written and read word — a uniquely human privilege. Audiences will be surprised and delighted by the fascinating librarians in this entertaining and enlightening film, and will emerge with a greater appreciation for the range of literature and materials available to them thanks to our nation’s librarians. The film was written and directed by Ann M. Seidl, a library consultant. For a bref interview with Ann, you want to click wildly right now. Tip of the hat to the great pop culture blog, Pop Candy, for the inspiration. Nice! I love that Parker Posey clip – there ain’t a librarian alive that wouldn’t find that funny. I love Party Girl, it was such a refreshing view of librarianship.